Munch Mancini and little daughter Asia are doing just fine. Munch rejoices in her job as an auto mechanic at the Brentwood Texaco. She and Asia have a house, not in tony Brentwood, and a dog, and Munch has been off drugs for years. She plans to stay that way. It's tough, though, when people from her old life resurface. Such a person is Lisa Slokum, Asia's aunt. Lisa has always meant trouble, and why should now be any different? It seems she has bolted from the Witness Protection Program with her two daughters, fifteen-year-old Charlotte and eleven-year-old Jill, and she needs Munch's help. Would that it were so simple. Munch will need to call upon Rico Chacn, a fine cop but not-so-fine boyfriend whose commitment to her on the nonprofessional side seems to be wavering. And before Munch can sort out her love life she must try on the role of auntie to Asia's new cousins, which is not easy when the teenaged Charlotte goes missing and her mom, Lisa, lands in jail. Why did Charlotte run away, and where is she now? Is she in danger of becoming one of Hollywood's lost street children? Does she have information about the recent death of school friend Steven Koon? And why was a lock of her hair found stuck to a piece of duct tape in a ransacked storage locker? Munch must unravel the mystery of young Charlotte's complex life before it's too late to save her. To do that, she needs help from Rico, who's investigating the Koon boy's death. Will their professional alliance rekindle their romance? Should she take him back? Does he want to come back? Can she trust him? 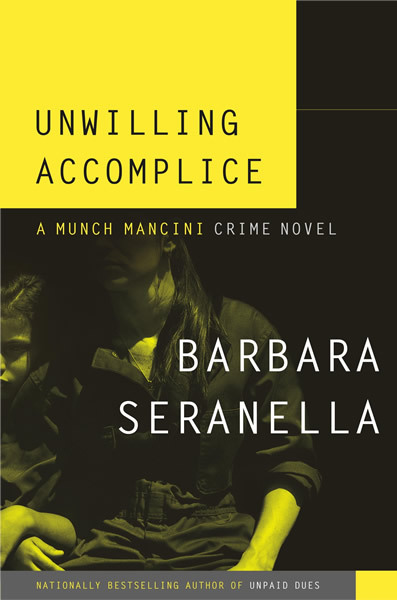 With its pulsating suspense and penetrating look at family relationships and the universal need for love and affirmation, Unwilling Accomplice is the best yet from a versatile author whose passionate voice shines through her fast-moving prose. "Avoiding preachiness and platitudes, Seranella expertly contrasts Munch's past life, her present one and her hopes for the future. Vivid and compelling storytelling coupled with a complex and convincing heroine should expand Seranellas readership even further."